The SOE hosts students from eight universities at the third popsicle stick bridge competition. The competition brought together students from universities across Lebanon. The students presenting their project. The LAU engineering students pictured with Dr. El Khoury. 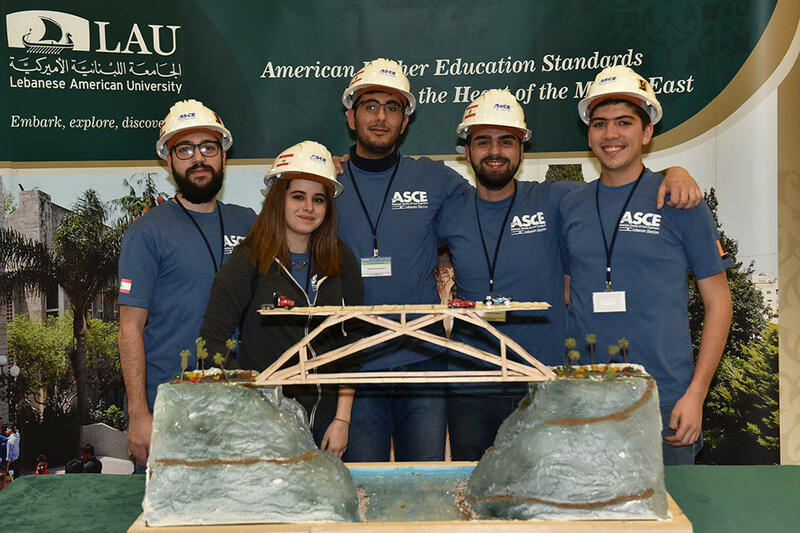 One group of the LAU students who participated in the contest with their stick bridge. The LAU team that secured a place among the winners. 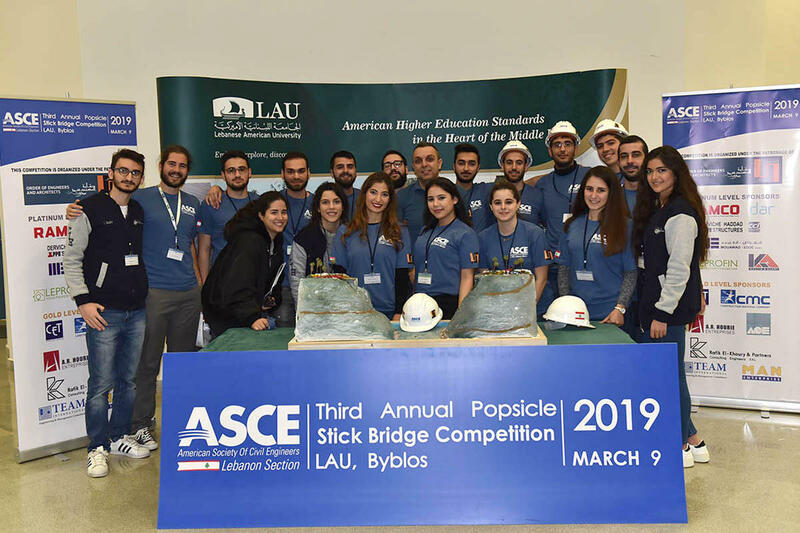 LAU’s School of Engineering (SOE) was proud to host the third American Society of Civil Engineers (ASCE) Interuniversity Popsicle Stick Bridge Competition at LAU’s Byblos campus. 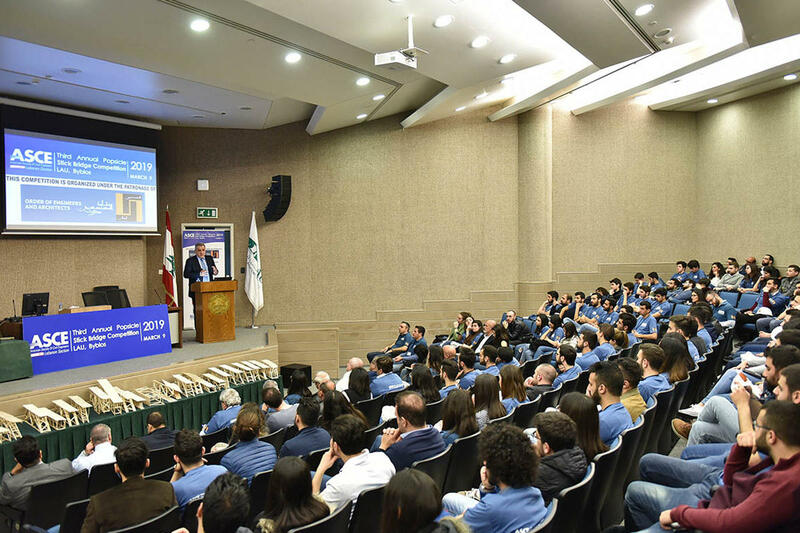 The competition brought together 115 students from nine universities – including LAU – across Lebanon in order to test their engineering prowess, but the underlying theme for the day was the importance of interaction, problem solving, and simply having fun in the field of civil engineering. Besides LAU, the participating institutions were the American University of Beirut, Balamand, Beirut Arab University, Notre-Dame University, St Joseph University, the Lebanese University, City University, and Rafic Hariri University. Over the past few weeks, participating students were busy designing and building their bridges out of ordinary popsicle sticks, all while adhering to strict design guidelines and specs. Their hard work was tested on Saturday, when each bridge was loaded until its failure, or breaking point. The event kicked off with each team’s presentations of their project posters and bridge designs. Guy Tabet, president of ASCE’s Lebanon Section and CEO of CCL Prestressed Concrete Specialists, welcomed the participants and stated the importance of the interaction between academia and industry for exchanging ideas and knowledge. He also linked the competition to the overall calling of engineers. The students were then addressed by SOE Interim Dean Raymond Ghajar, who also emphasized the importance of engineers’ soft skills as they transition into their professional careers. While engineers typically focus on problem solving, as evidenced by the students’ bridge projects, Dr. Ghajar charged them to also focus on the social impact of engineering solutions. In keeping with the theme of problem solving, students heard from keynote speaker Lara Tabet, senior engineer and hyperloop global coordinator at engineering and design firm Arup. Tabet introduced the concept of hyperloop – a point-to-point transport system for passengers and freight that is envisioned to be faster, cheaper and greener than any conventional mode of transportation used today. How, she asked the students, can budding civil engineers actively participate in a field that seems to be progressing so quickly? The answer is a change in approach. “The direction the industry is headed today is such that the focus will be less on the calculations component of engineering and more on the importance of the human role in understanding basic principles and integrating the various outputs and work streams required to implement infrastructure projects,” she said. Following the speeches, the afternoon was devoted to load capacity testing each team’s bridge. As teams waited in suspense to have their structures tested, the excitement in the room was palpable. Youssef Baytam, a fourth-year civil engineering student at LAU, waited with anticipation for his team’s turn at the testing apparatus. “This competition brought the principles of engineering together for me. It was reassuring to see how intuitive the design and construction process was – from understanding the behavior of the members to watching our design come to life was proof that I am doing what I love,” he said. “We have had so much fun preparing for this event, but the feeling today is overwhelming – our bridge exceeded our expectations!” said an excited Diana Shami, a member of an all-women team from the University of Balamand, aptly named Women in Engineering. The results of the 22 teams’ bridges were called. 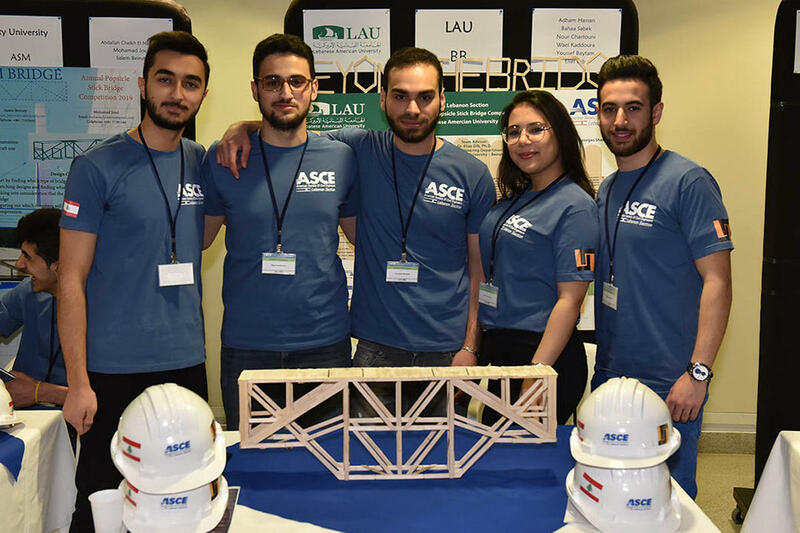 The teams from Rafic Hariri University (RHU) and Lebanese University shared first prize for building the bridges that attained the highest scores in multiple categories, including bridge capacity, weight and aesthetic design. Notre-Dame University and RHU teams came in second place. 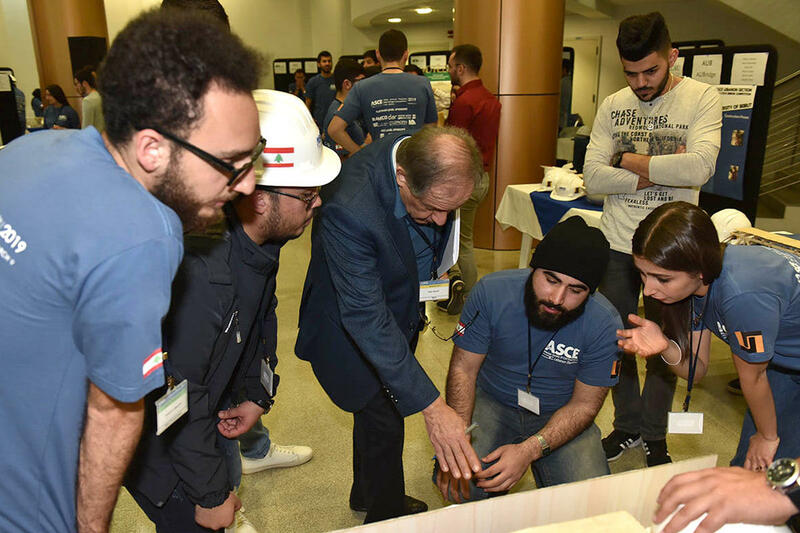 Dr. John El Khoury, LAU associate professor and vice president of the ASCE Section in Lebanon, knows that events like this are pivotal for university students as they transition into careers.